Does your dog have a sore in the hair that they keep licking or scratching? Is it also enlarging and crusty? Then they probably have a hotspot. The picture above at top left shows the typical appearance of a hotspot before treatment. The crusts in the hair are dry and there’s no sign of the drama going on underneath. 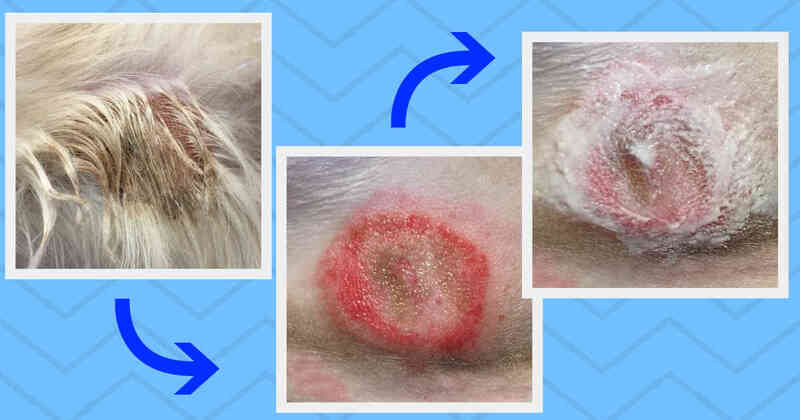 Pyoderma is a surface infection of dog’s skin, either as pimple-like lesions or the dry crusts shown here. A similar form, the epidermal collarette, is a slowly enlarging ring with a fine crust at the outer edge, and hair loss within. Pyoderma is usually found as multiple lesions on the trunk, and can have been present for weeks. Although dogs do not appear unwell or distressed, they still need treatment with antibiotics. Lick granulomas are very long-term skin infections caused by repetitive licking of an area. They are usually found on legs as raised areas of thickened, hairless skin with a broken centre. These dogs typically need very long courses of antibiotics plus attention to why the licking occurred in the first place. In comparison to both of these, hotspots are fast growing and painful. A hotspot can go from nothing to several centimetres wide in one day, and double in size each day after. Additionally, hotspots cause dogs much more acute distress. I’ll explain the treatment of hotspots later. However, bacterial infection of intact skin doesn’t just happen on its own. Therefore it’s vital to first understand why some dogs get hotspots and others don’t. These predisposing factors create a small wound that gets infected. The infection causes pus to form and get trapped in the surrounding hair. 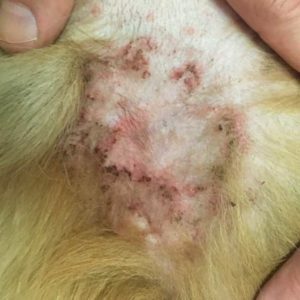 Hair is the key to why hotspots grow, and why they happen to dogs, not people. By trapping the pus, hair keeps the infection spreading along the skin surface. Additionally, the pus at the skin surface stays protected by the dried layers held above it. It gets even worse if the dog can get to the area. Licking adds extra moisture that feeds the infection (this is why salt water bathing also doesn’t help). Scratching and biting create more areas of broken skin. Eventually a hotspot gets large enough that the infection causes the dog to be lethargic as well as in pain. Furthermore, if a hotspot isn’t stopped, the skin can begin to die. Many dogs also need oral antibiotics. Almost every time I see a treatment failure, it’s because the owners allowed the crusts to build up again. You need the wound to look as clean as the middle picture after each wash (although rapidly less red). You keep it this clean by bathing as often as needed, usually two to three times a day. If crusts form, they need to be soaked off each time. But Mother Told Me Not To Pick My Scabs! Yes, but you aren’t as hairy as your dog (I assume). Have you noticed that I don’t use the word scab? Scabs are thin, dry and cover clean wounds. We almost never see them in dogs. Crusts, on the other hand, are made of dried wound ooze and pus. They cover infected wounds and protect the bacteria from oxygen, disinfectants and drying. Look again at the pictures: you have to make the wound look worse if you want it to get better. Just a warning though. Most dogs need sedation and pain relief first, especially if you ever want them to trust you again. Clipping a hotspot of that severity is extremely painful. Regardless some dogs will always get a hotspot from time to time. I know a few. All these need is a quick trip to the vet to have them clipped and treated. You get pretty good at spotting them. I saw a case recently where the owner was the one showing me where they were! Hi there, thanks for the clear and concise article regarding these nasty things! So there is no evidence to suggest hot spots can be caused by a food allergy? Thanks Pam Hotspots can certainly be caused by any skin problem. That includes food allergy, it’s just that as a cause of skin problems food is much less common than environmental allergens.